Abstract: This article describes the multidisciplinary management of a 10-year-old boy who presented with severe hypodontia. Treatment involved tooth transplantation and space opening for the provision of single unit osseointegrated implants. It will demonstrate the need for good lines of communication between orthodontists, maxillofacial surgeons, implantologists and restorative dentists to ensure a successful outcome for the patient. Clinical relevance: To illustrate the importance of multidisciplinary care and meticulous planning in the treatment of patients with severe hypodontia. Author notes: Sarah E Griffiths, BDS, MFDS RCS(Edin), MSc, MOrth RCS Post-CCST, Department of Orthodontics, Manchester Dental Hospital and Jonathan Sandler, BDS(Hons), MSc, PhD, FDS RCPS, MOrth RCS, Consultant Orthodontist, Chesterfield Royal Hospital, Chesterfield Road, Calow, Chesterfield S44 5BL, UK. 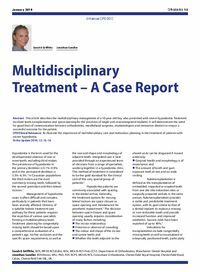 Objective: To describe and demonstrate the importance of considering the entire list of clinical problems when setting up patients for multidisciplinary dental care.